Elephants Journey to Pay Respect...But How Did they Know? 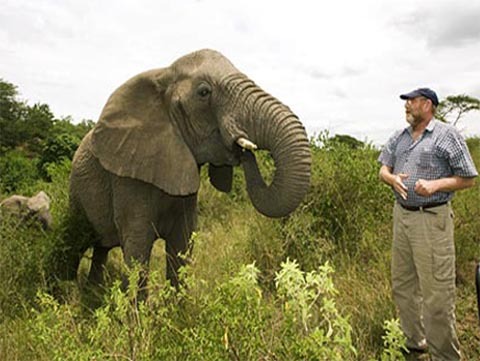 In March of 2012, for 12 hours, two herds of wild South African elephants slowly made their way through the Zululand bush until they reached the house of late author Lawrence Anthony, the conservationist who had saved their lives. 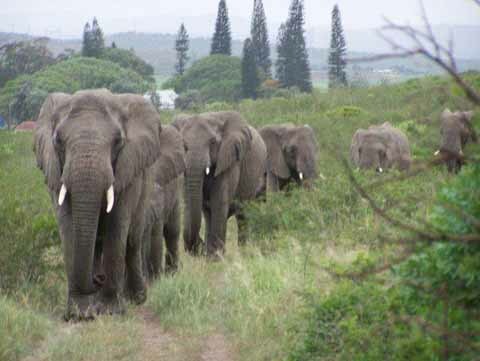 But these are wild elephants in the 21st century, not some Rudyard Kipling novel. It was 4:45 a.m. and I was standing in front of Nana, an enraged wild elephant, pleading with her in desperation. Both our lives depended on it. The only thing separating us was an 8,000-volt electric fence that she was preparing to flatten and make her escape. Nana, the matriarch of her herd, tensed her enormous frame and flared her ears. ’Don’t do it, Nana,’ I said, as calmly as I could. She stood there, motionless but tense. The rest of the herd froze. It had all started several weeks earlier with a phone call from an elephant welfare organization. 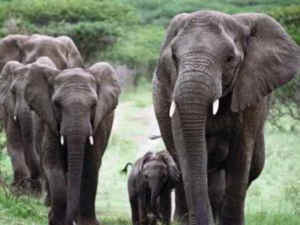 Would Anthony be interested in adopting a problem herd of wild elephants? They lived on a game reserve 600 miles away and were “troublesome,” recalled Anthony. “They had a tendency to break out of reserves and the owners wanted to get rid of them fast. If we didn’t take them, they would be shot. What followed was heart-breaking. One of the females and her baby were shot and killed in the round-up, trying to evade capture. Last off was the 15-year-old son of the dead mother. “He stared at us,” writes Anthony, “flared his ears and with a trumpet of rage, charged, pulling up just short of the fence in front of us. “His mother and baby sister had been shot before his eyes, and here he was, just a teenager, defending his herd. David, my head ranger, named him Mnumzane, which in Zulu means ‘Sir’. We christened the matriarch Nana, and the second female-in-command, the most feisty, Frankie, after my wife. “We had erected a giant enclosure within the reserve to keep them safe until they became calm enough to move out into the reserve proper. “Nana gathered her clan, loped up to the fence and stretched out her trunk, touching the electric wires. The 8,000-volt charge sent a jolt shuddering through her bulk. She backed off. Then, with her family in tow, she strode the entire perimeter of the enclosure, pointing her trunk at the wire to check for vibrations from the electric current. “As I went to bed that night, I noticed the elephants lining up along the fence, facing out towards their former home. It looked ominous. I was woken several hours later by one of the reserve’s rangers, shouting, ‘The elephants have gone! They’ve broken out!’ The two adult elephants had worked as a team to fell a tree, smashing it onto the electric fence and then charging out of the enclosure. “I scrambled together a search party and we raced to the border of the game reserve, but we were too late. The fence was down and the animals had broken out. Their bid for freedom had, if anything, increased their resentment at being kept in captivity. Nana watched my every move, hostility seeping from every pore, her family behind her. There was no doubt that sooner or later they were going to make another break for freedom. Then, in a flash, came the answer. I would live with the herd. To save their lives, I would stay with them, feed them, talk to them. But, most importantly, be with them day and night. We all had to get to know each other. It worked, as the book describes in detail, notes the London Daily Mail newspaper. 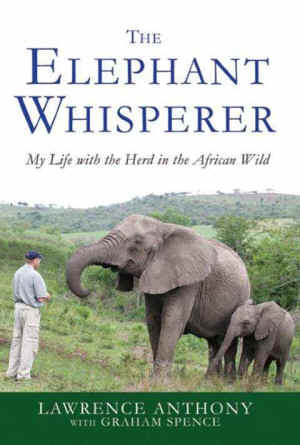 Anthony was later offered another troubled elephant — one that was all alone because the rest of her herd had been shot or sold, and which feared humans. He had to start the process all over again. And as his reputation spread, more “troublesome” elephants were brought to Thula Thula.